KANSAS CITY, Mo. — As the community begins to mourn the 17 people killed after a duck boat capsized and sank Thursday evening, questions remain as to how such a tragedy could have happened. This breakdown shows everything that has happened since as early as 11:30 Thursday morning. All times are local. 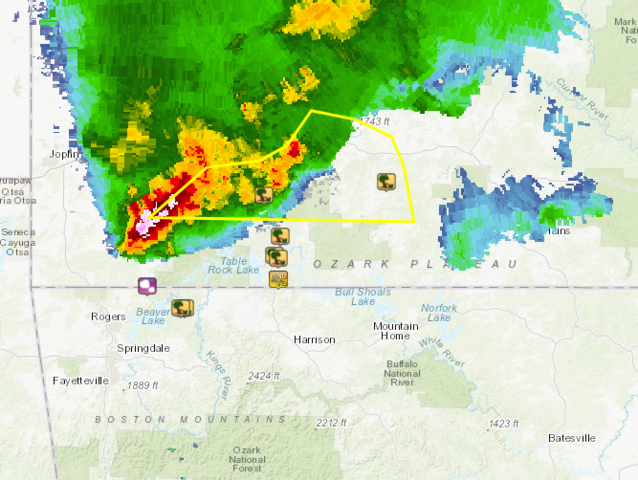 11:30 a.m. — A severe thunderstorm watch is issued for Stone County, Missouri, and surrounding areas. 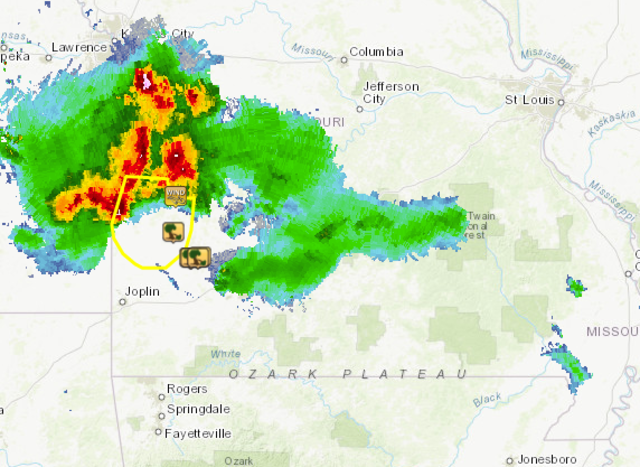 5:06 p.m. — The National Weather Service in Springfield issued a Severe Thunderstorm Warning For Barton, Cedar, Dade and Vernon counties until 6 p.m. These counties are to the north of the Branson area. The storm was moving to the south/southeast. 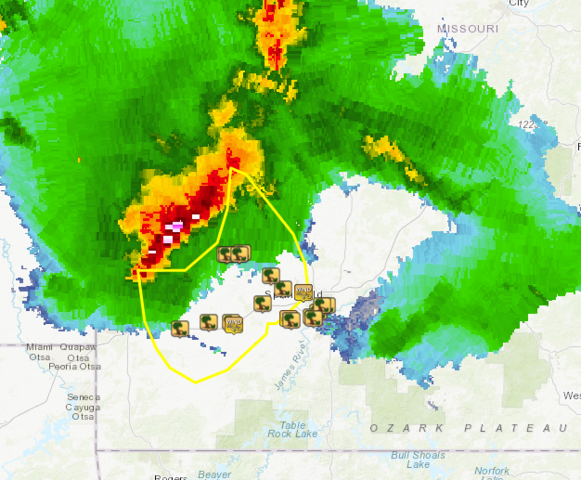 5:11 p.m. — An NWS meteorologist reported the storm was strengthening with 60 MPH west of Nevada, Mo. 5:45 p.m. — NWS issued Thunderstorm Warning for Barry, Cedar, Dade, Greene, Jasper, Lawrence, Newton and Polk counties until 6:30 p.m. These counties are to the north of the Branson area. 6:07 p.m. — NWS issued Thunderstorm Warning for Barry, Christian, Greene, Lawrence, Stone and Webster Counties until 6:45 p.m. Approximately 6:11 p.m. — A NWS meteorologist notes the storm line had strengthened considerably with 80 mph winds around Springfield. 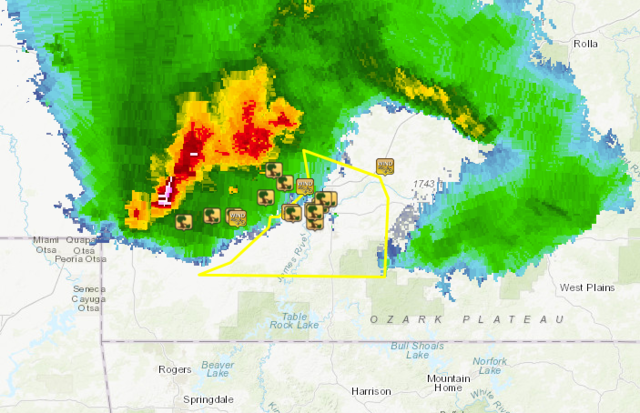 6:45 p.m. — NWS issues new Thunderstorm Warning for Barry, Christian, Douglas, Greene, Lawrence, Stone, Webster and Wright Counties until 7:45 p.m. Approximately 7 p.m. — ‘Ride the Ducks’ boat capsizes amid strong winds and waves, then sinks. 7:09 p.m. — First emergency call. 7:12 p.m. — Southern Stone Fire District tweets multiple agencies are responding to an emergency near the Branson Belle. 8:23 p.m. — Southern Stone Fire tweets that the incident is one of mass casualties. 8:38 p.m. – Scripps affiliate KSHB-TV receives a video showing the moments before the capsize from a witness onboard the Branson Belle. 9:30 p.m. — Stone County Sheriff Doug Rader holds a press conference. Death toll at 8. 10:14 p.m. — Cox Health tweets they’ve received seven patients from the incident. Two were in critical condition at the time. 10:54 p.m. — Branson opens City Hall to families of victims. The City of Branson has opened City Hall for some of the families involved in the boat incident on Table Rock Lake. Concerned family members can call (417) 337-8515. We have people standing by to help. Please be patient with us during this difficult time. Thank you. 11:03 p.m. — The American Red Cross arrives to assist the families. 11:23 p.m. — Rader says 3 more bodies have been recovered, bringing the death toll to 11. 11:30 p.m. — Taney County divers called off, with Missouri State Highway Patrol divers taking over in the morning. 12:00 a.m. — Media briefing from City of Branson representative reiterating information about city hall and expressing condolences to victims’ families. 6:35 a.m. — Company releases a statement on the incident, calling it a “tragic accident… that has deeply affected all of us,” and saying they would continue to assist the families. The ‘Ride the Ducks’ website is wiped in place of the statement. 7:15 a.m. — Two more bodies are recovered by divers, bringing the death toll to 13. 9:00 a.m. — Rader holds another press conference during which Missouri Gov. Mike Parson makes an appearance. Both ask for the public to be patient with the investigation. 10:35 a.m. — Sheriff declares everyone who was on board accounted for after divers pull four more people from the water. The death toll rises to 17. Seven people were injured, six of whom remain in the hospital. Seven more people are uninjured after being rescued. 11:52 a.m. — Cox Health tweets that Missouri Gov. Mike Parson visited survivors at the hospital. Community members begin to leave flowers at the abandoned cars of the victims, a makeshift memorial is built with teddy bears and candles, and people pray in the 'Ride the Ducks' parking lot.